This weekend we bring you inspiration from the extensive and diverse ranges of papers, alphas and embellishments of SEI. From the new Madera Island range which is lusciously chocolatey and earthy - to the happy girliness of Ally's Wonderland, SEI has something for everyone. And that something also comes in the form of another giveaway!! 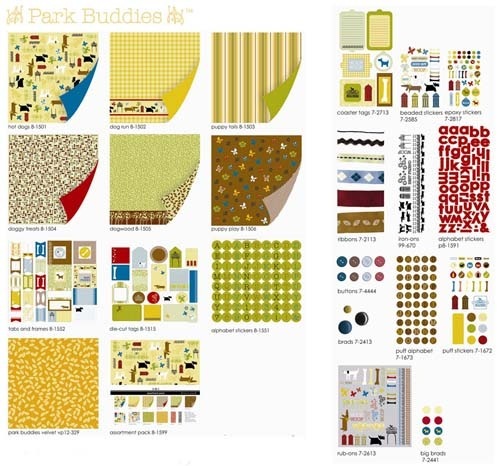 Leave a comment on this post and one lucky random person will receive a so-cute-we-can-barely-bear-to-give-it-away sample pack of one of their new fun and funky new lines - the doggy themed Park Buddies. We hope you enjoy this Friday's inspiration post. Caz created this layout of spectacular photos she took of the recent eclipse. The colours in these new SEI Madera Island papers seemed to go perfectly with the colours and the moon. The little owl serves as a pull-tab for the journaling card and adds a whimsical ‘night time’ touch. We love that Emily Potts captured this important stage in her son's life both by her photographs and by including a little piece of history - his handwriting. These SEI pp's co-ordinate perfectly with her theme and the 'blocked' style layout mimics the structure and routine that we all remember when we think about our early school years. What a creative and inspiring layout! Thanks, Emily. 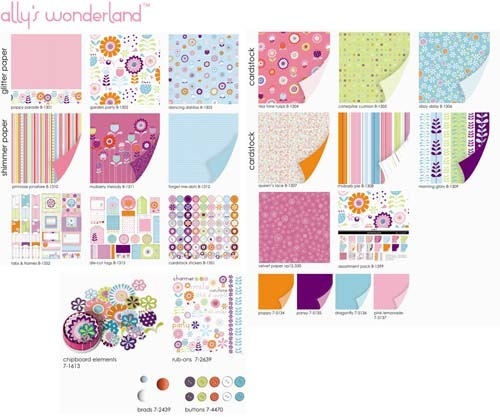 The colours and patterns that feature on the new Ally's Wonderland range of SEI products are bold, funky and totally HAPPY! Donna couldn't go past them. 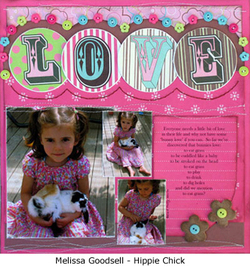 In fact, this layout was created in a frenzy of inspiration and creativity within minutes of their arrival at her home! The range of glittery flowers are beautiful and the new extra large brads make a fun embellishment all on their own. 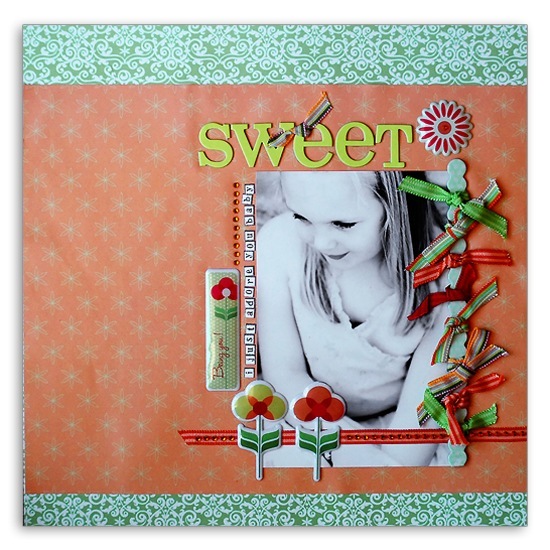 This gorgeous layout by Ingrid Ijsselstein from the Netherlands is based on Sketch #22 designed by Valerie Salmon. 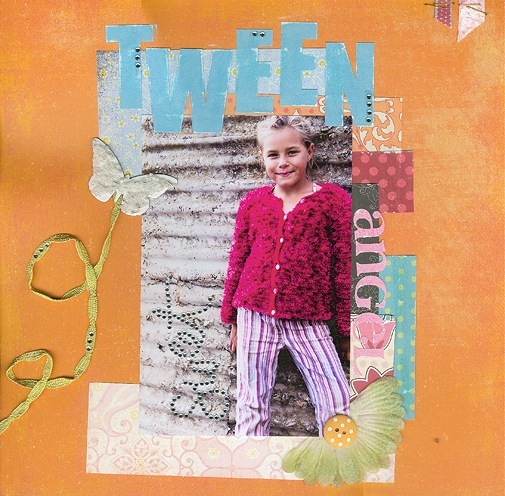 Ingrid has used SEI Ally's Wonderland papers and rub-ons plus a semi circle of SEI Penelope's Potpourri Buttons to create a beautiful, bright page. Thanks for sharing Ingrid. SEI's Doodley Doo Girl pp's have a certain whimsical appeal that are perfect for candid photos of children doing, well...childlike things. Anna added a little doodling, a mixed alpha title and the all-important journalling and voila - the gorgeous layout you see before you. Thanks for sharing, Anna! 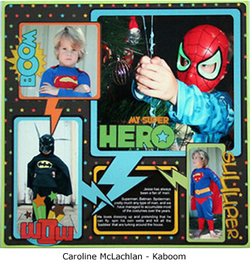 This layout was also made by Ingrid. 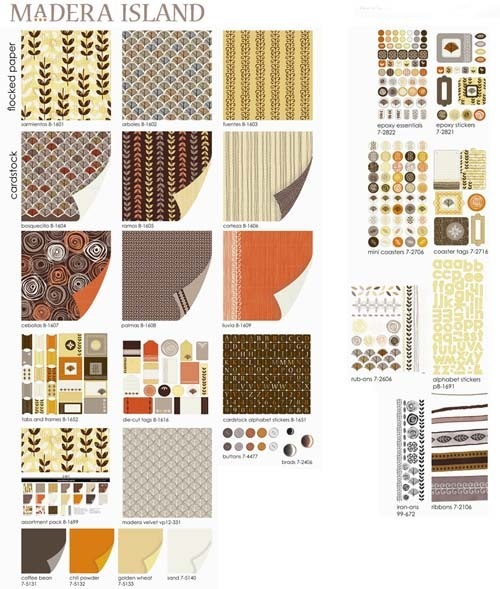 She had to use 10 different sorts of patterned paper for a challenge. 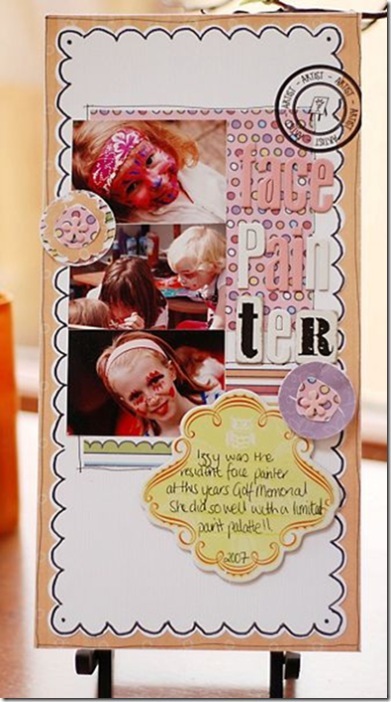 Ingrid used a mix of Penelope's Potpourri by S.E.I. and Cape Town & Charlotte by Scenic Route. You have to agree that they go together beautifully . 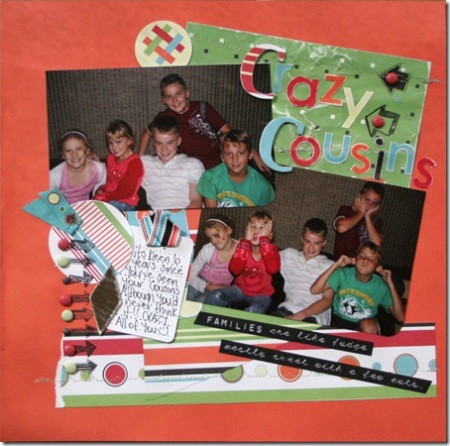 Ingrid made this Mothers Day album for her Mum inspired by one that her sister in-law had made. 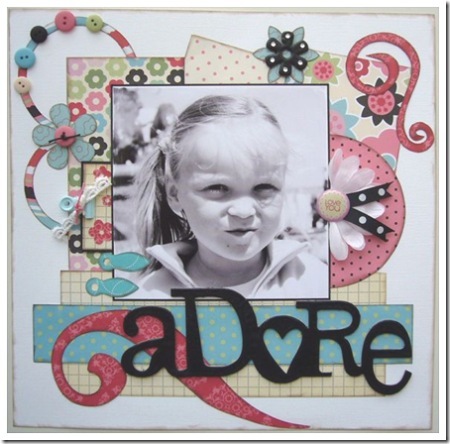 Made entirely from the funky Penelope's Potpourri papers from SEI, she has also added SEI buttons, Heidi Swapp Flowers, Basic Grey Rub-ons and Quickutz letters. Such a gorgeous gift. 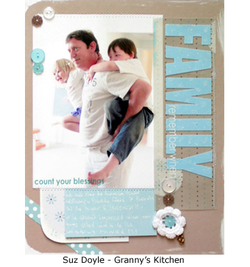 Simple, elegant layouts have timeless appeal and this layout by Staci Compher is no exception. Staci demonstrates that the beautiful patterns on SEI patterned papers don't always require masses of embellishments, but matched with just a few little bits and pieces can result in stunning layouts such as this one. 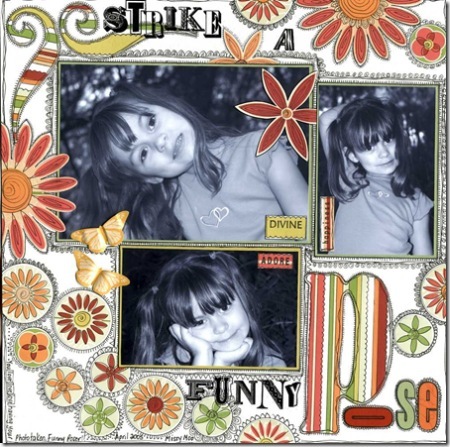 Suz Doyle has used an assortment of papers from Cupid's Candy shop to highlight this simple layout of her daughter's determination to learn to ride her bike, in both the 'speed' stripes (!?) and covering the BasicGrey monogram letters. SEI's Citrus Kick was an obvious choice to Suz when playing with this photo of her children sitting at their breakfast bench eating like the flawless children i'm sure we all know they're not. The colours are bright and fresh and somehow breakfast-ey and the epoxy stickers and ribbon are just fun. SEI products are sturdy and often quite different to many other products on the market. The epoxy and puff element stickers are a fabulous example of this. 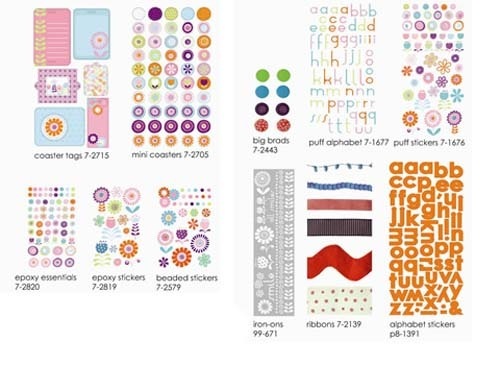 Donna often reaches for her collection of SEI stickers when a layout needs a little 'lift' and the patterned papers are generally always the foundation for her work. The bright funky colours of the SEI Smarty range is so eye catching and fun that Jaimie couldn't wait to scrap these crazy pics of her family. By adding the Sass Lass doodle dings with SEI tags, brads & ribbon she has continued with the fun theme of the page. It's fun to re-vamp an older layout with some new products. 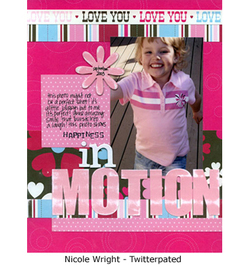 The permawriter pen is so easy to use on both cardstock and over your photos. 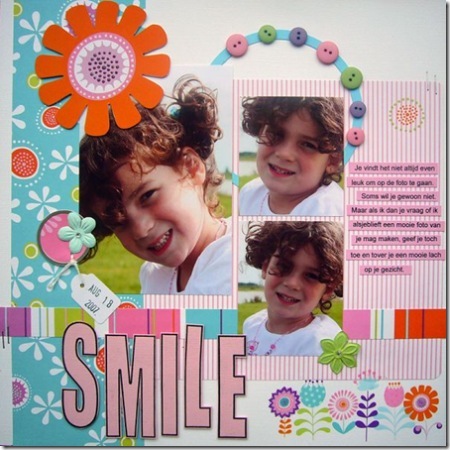 Maxine has created this gorgeous layout using papers from the Winnie's Wall's range - a classic favourite. 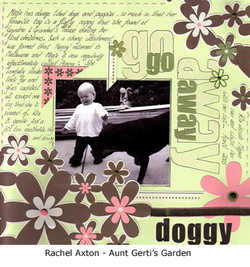 Donna created this layout for Scrapbook Creations Magazine using a variety of products, but mostly incorporating SEI patterned papers and SEI So Bold Alphabet stickers. 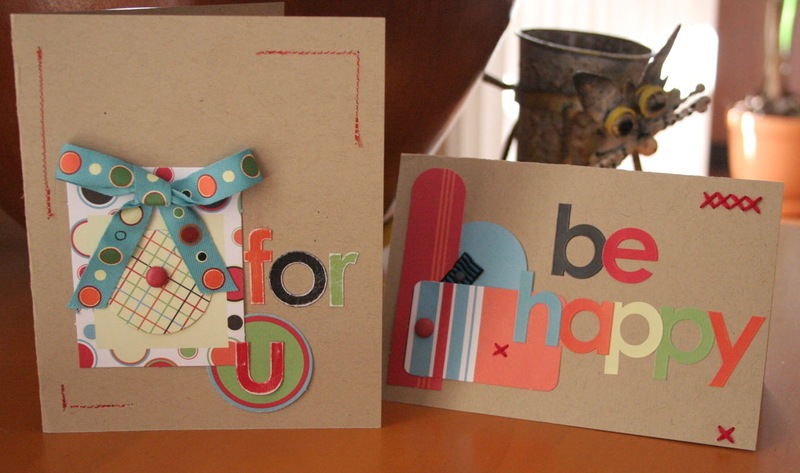 Donna loves the So Bold range of cardstock alpha stickers as they are just so sturdy that they can be painted, distressed or sanded with total ease. 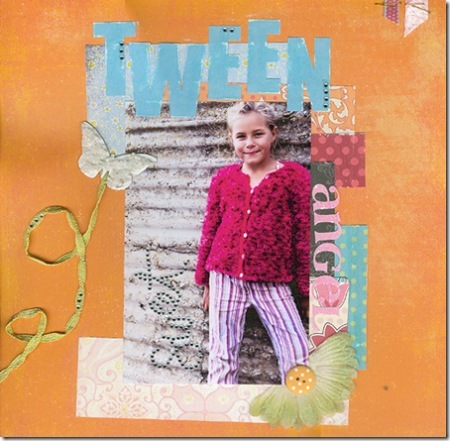 This layout, also created by dt member Donna, uses little else, but SEI products. 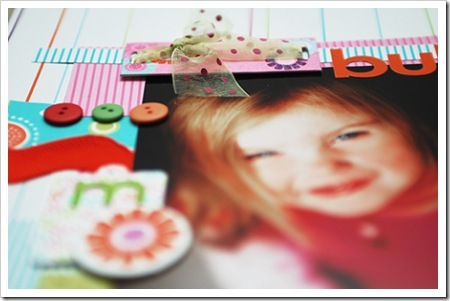 Everything from buttons, tags and frames, pp, epoxy stickers and cardstock alphabet stickers. It just goes to show that SEI products really are quite versatile and perfect for fun, bright layouts such as this. What a cute Sleeping Beauty Donna's eldest daughter is! This stunning layout by SEI Design team member, Maria Burke beautifully demonstrates that SEI layouts don't always need to be bright and bold. The soft, muted tones of this layout highlight the look and feel of photo perfectly! We were immediately struck by the simplistic, uncluttered design and pure 'sweetness' of this particular layout, also by Maria Burke. Thank you for sharing your beautiful layouts with us, Maria. 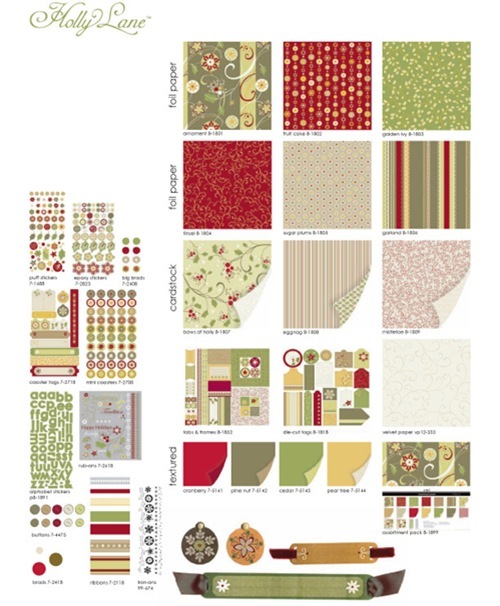 Donna was inspired to create this layout the moment she laid eyes on this lovely new range of SEI patterned papers - 'Cupid's Candy Shop'. 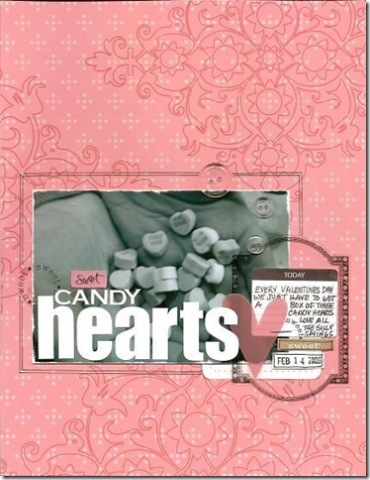 These papers are sweet and girlie and the multitude of hearts in varying sizes and colours simply demanded that she hand-cut at least a few little hearts. In creating this layout, Donna started with the 'Flirty Flavours' patterned paper to form an oversized photocorner. 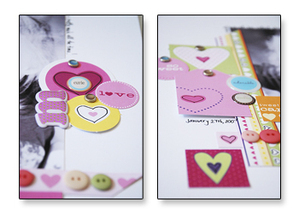 She also added a few SEI buttons to the mix and a little doodling on random hearts within the paper design. 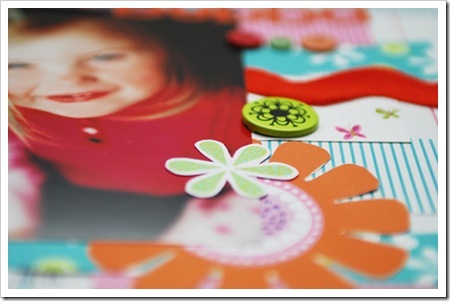 The tabs and frames and the die cut tags were gradually layered to build up an interesting array of colours and shapes around the photo. Donna has also used a few pearl brads and epoxy stickers, all by SEI, to finish off the layout and add that little bit of extra dimension. This layout is made completely using SEI products demonstrating just how versatile and complete the SEI range of products really is! 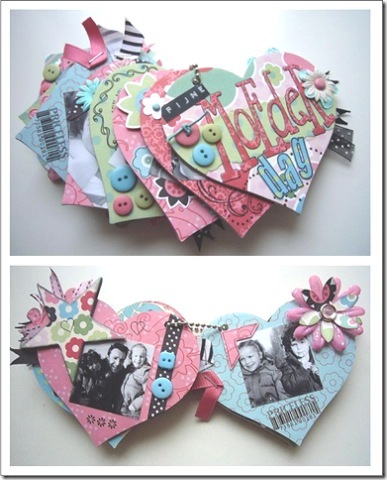 Suz Doyle also had a play with the Cupid papers, and because she couldn't decide which one she liked best so covered big BasicGrey monograms with a variety of them. 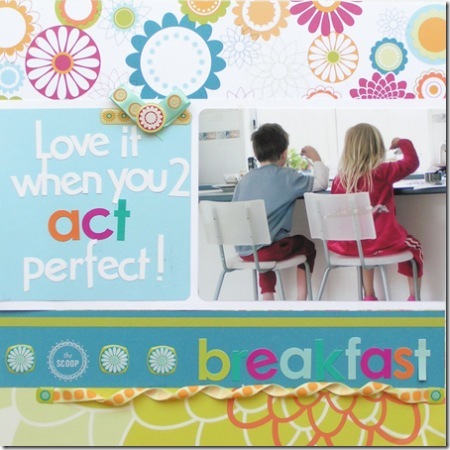 Heidi Swapp rubons on the versatile new Deluxe Designs Chip Bases made a great spot for a bit of short journalling. For Mel Goodsell, this photo worked perfectly with the SEI so girly range. She hand sewed SEI so girly buttons to help frame the photo while the SEI so girly coaster tags on the left worked well to balance the layout. A touch of Heidi bling finished off the layout nicely. 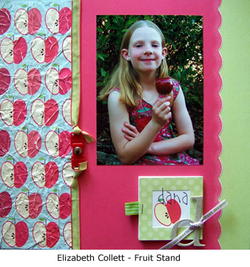 In this layout, Mel again combined several products from the SEI so girly range - patterned papers, buttons, coaster tags and cardstock tabs, frames and labels. 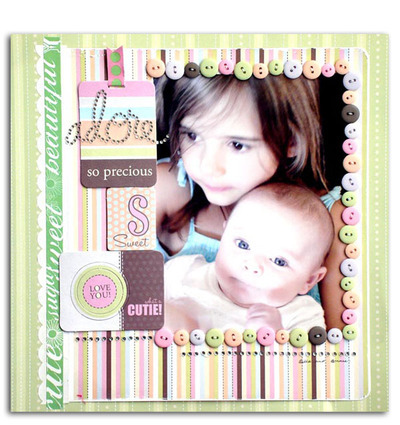 The Heidi Swapp Sassy Sweet decorative tape was added around the entire edge of the photograph to create a decorative border. We also share some layouts we've found online, and thank the artists for allowing us to upload them here for our weekend dose of inspiration. 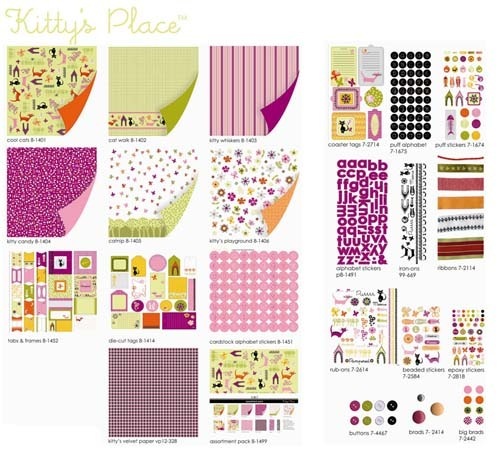 We were instantly drawn to this layout by Jamie Gavin with it's bright colours and creative doodling. 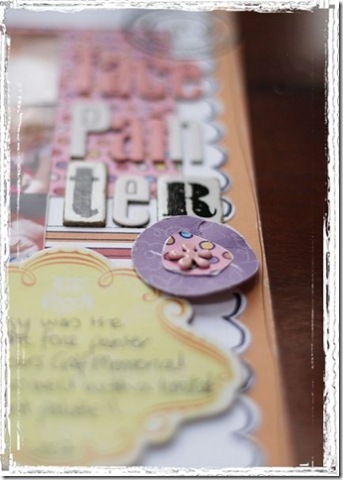 We love that Jamie overcame an unexpected pen leak by further decorating her layout with splatters of white ink. 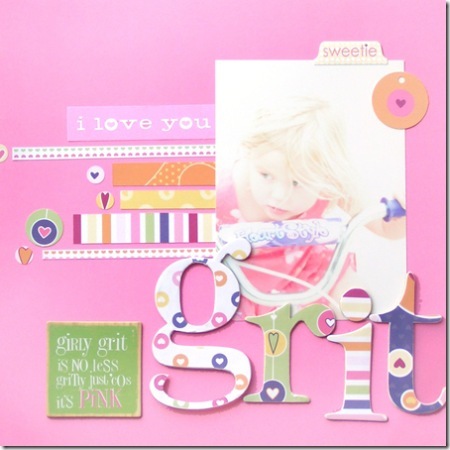 The splatters add a whole new dimension to this fun and girlie layout. 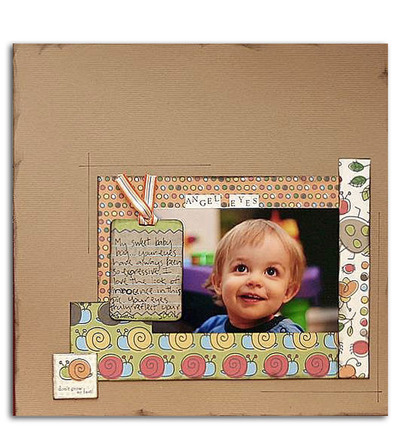 'Angel Eyes' created by Melanie McFarlin is a simple layout with an emphasis on the photo of her "adorable little boy". 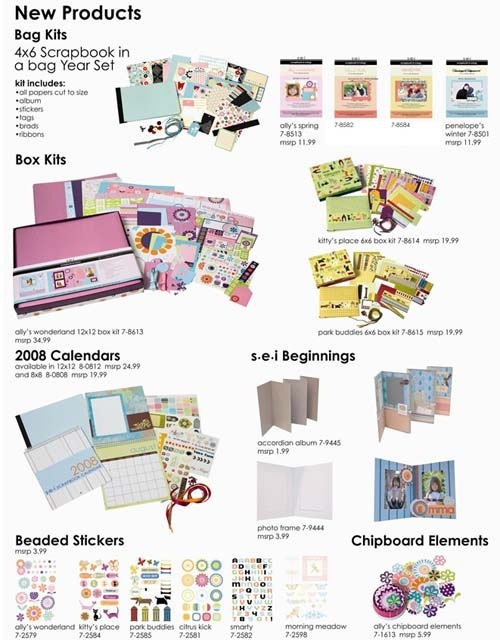 The simplicity of the design and the cute boyish papers make this layout eye-catching and fun, but with an obvious sentimental focus as well. 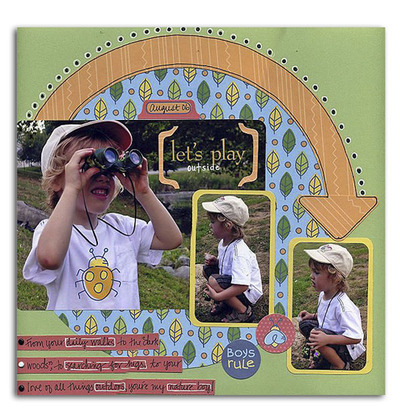 'Let's Play Outside' is a stunning layout created by Anabelle O'Malley. This layout also incorporates SEI's Doodley Doo Boy papers in a fun and funky design. 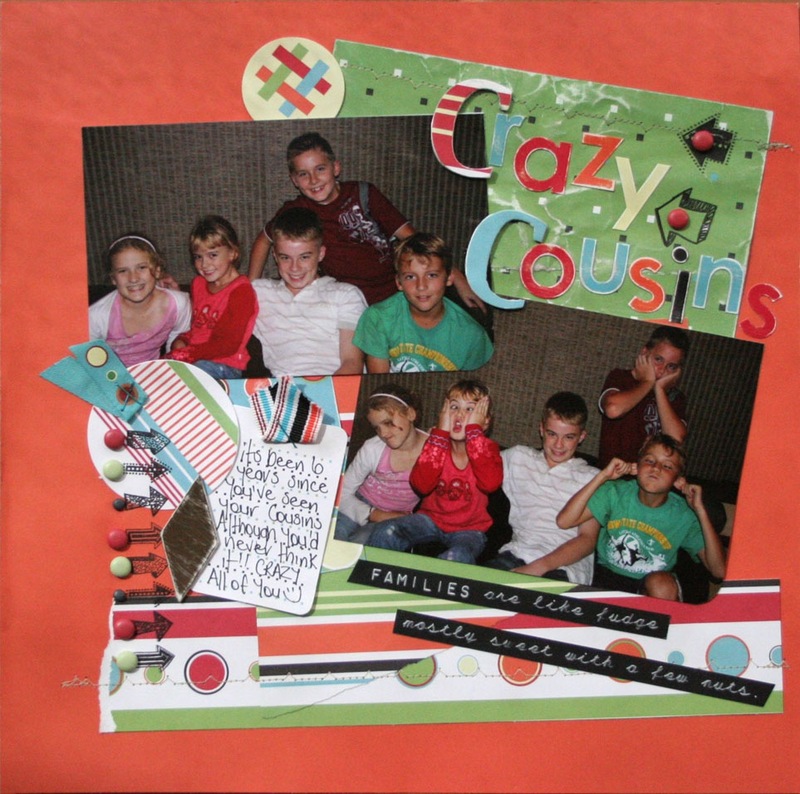 We loved the way Anabelle was able to include multiple photos without overcomplicating the layout itself. The oversized arrow framing the circular piece of patterned paper is also quite ingenius in our opinions. We also adore the simple doodling around the arrow and also throughout the journalling. This week we are showcasing some of the work our Design Team has done using SEI.